The question of legitimacy is, of course, a central one in the study of de facto states. Unrecognized states don’t have it from the international community (or from only a few as in the case of Abkhazia and South Ossetia), and so it is all the more important that they demonstrate to the world that they have it internally. Its self-validation, self-justification and part of the struggle to nudge the international community into moving some way towards recognizing some form of legitimacy in their case. Dichotomizing legitimacy into external and internal components is helpful as a first step in asking deeper questions about legitimacy but what do these notions really mean? Given the full spectrum sensitivity of parent states to any form of international legitimacy to de facto states, ‘external legitimacy’ is not a single condition (UN membership, for example) but a hierarchy they fear is a slippery slope. Should international mobile phone companies be able to offer service in Abkhazia, for example? What about Visa and Mastercard usage? Should Save the Children be allowed to operate, or the World Health Organization? And what is ‘internal legitimacy,’ a condition permanently enjoyed and earned by de facto states? Is there a difference between what residents (can we call them citizens without playing the legitimation game?) think of the idea of their state, and what they think of its institutions or of the government of the day? Many self-styled US ‘patriots,’ after all, loudly proclaim that they love their country but hate their government (and sometimes its laws, especially if they have anything to do with gun control; c.f. the NYT article on county sheriffs recently that didn’t point out that most of these same sheriffs are secessionists as TRMS did last night). Is the same phenomenon observable in de facto states? “Convincing State-Builders? Disaggregating Internal Legitimacy in Abkhazia” is the latest article to be published as part of the De Facto State Research Project. It is available on Open Access from International Studies Quarterly, and will eventually appear in regular form in 2014. It explores the question of ‘internal legitimacy’ and seeks to use our 2010 survey to disaggregate this notion. Kristin Baake, UCL, took the lead in writing the article, with Ward and O’Loughlin helping with the statistics. My contribution to this particular article involved (re)conceptualization and (re)writing. Above is a photo I took in Ochamchire, Bagapsh’s home town, which I happen to like. 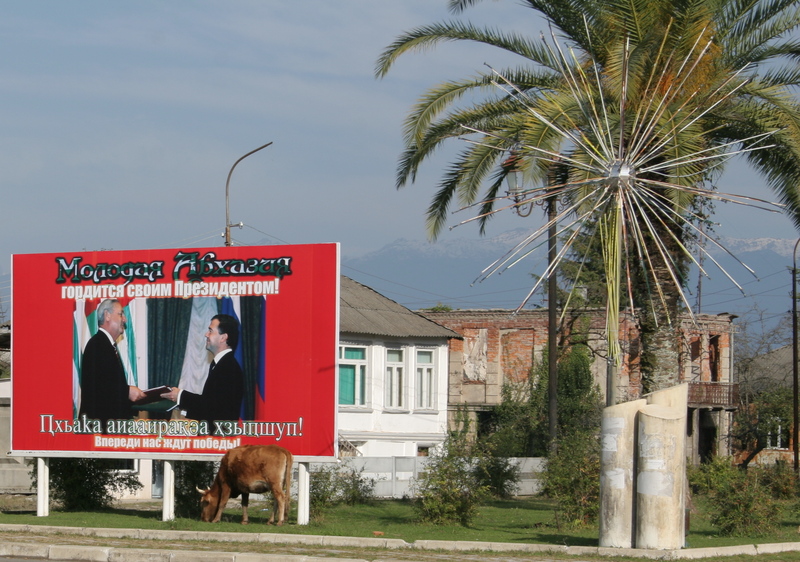 Behind the unipolar recognition of Medvedev is some prosperity but also the Georgian absence, the scars of war, the tourist signs of mountains and palm trees, while in the foreground is the banal present. This entry was posted in Abkhazia, Caucasus conflict, Current affairs, ethnic cleansing, Five Day War, genocide, Geography, Geopolitics, Georgia, legitimacy, Russia, Saakashvili, South Ossetia, World political map and tagged Abkhazia, legitimacy, public opinion. Bookmark the permalink.